This ride is a longer version of the classic Poison Spider Mesa ride. Rather than just an out-and-back route, the eMTB version includes a loop at the top end with the Golden Spike Jeep Road. Expect plenty of sand and technical slickrock. Although the riding might be challenging at times, you'll be rewarded with amazing views. This area is popular with Jeeps and other 4x4 vehicles. Due to many routes, and lots of unmarked roads, navigation is more difficult on Poison Spider Mesa than other areas in Moab. Take a good map and the MTB Project mobile app and be aware there is no way off of Poison Spider Mesa except on the Poison Spider Mesa Road you start on. If you find yourself lost, retrace your steps and return the way you came. Ride up Poison Spider Mesa 4x4 Road for 5.3 miles. This part of the route is a lollipop and will be retraced upon your return. Turn left at the Golden Spike Jeep Route (signed GS) and ride for 1.6 miles. Turn left onto Where Eagles Dare (WED), and continue for almost a mile. At an intersection, go straight to take in a grand viewpoint over Bootlegger Canyon and Corona Arch. From there, go back to WED and turn north. Continue for just over a quarter mile. At the sign that reads, “Where Eagles Dare Obstacle”, turn right (southeast) to continue on WED toward GS (Golden Spike). WARNING: Turning left here will take you on a route that contains slopes over 35 degrees and is not recommended for an e-bike. Heading southeast, continue on the WED to the intersection of Golden Spike and the Portal Connector Road. Follow Portal Connector Road for 0.7mi to the top of the Portal Viewpoint. Note: the Portal singletrack and Gold Bar Rim singletrack are non-motorized routes. Turn right and head southwest following signs for “PS”, or Poison Spider 4x4 Route for 2.8 miles. At this point, you are back on the original road you came in on. From here, return on this road for 5.3 miles, heading south to the trailhead and parking lot. Due to many routes, and lots of unmarked roads, navigation is more difficult on Poison Spider Mesa. Take a good map or the MTB Project mobile app and be aware there is no way off of Poison Spider Mesa except on the Poison Spider Mesa Road you start on. If you find yourself lost, retrace your steps and return the way you came. The amazing scenery and fun slickrock continues. 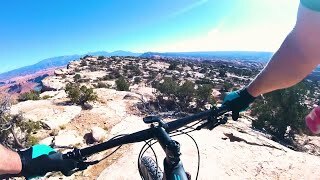 Immense swaths of slickrock riding. Cool massive hole in the rock.